I may have been a little too cocky going into this whole War and Peace thing. Sure, it's long and there are a ton of characters, but if I can read 400 pages I can read three times that many, right? It's just more pages, and I can refer to character list at the beginning if I forget who's who. Except it takes exponentially longer to read than you'd think because of all the flipping back and forth that is required. In addition to the aforementioned character list, there are copious footnotes translating the French (and sometimes German) text, as well as extensive endnotes explaining the historical context. 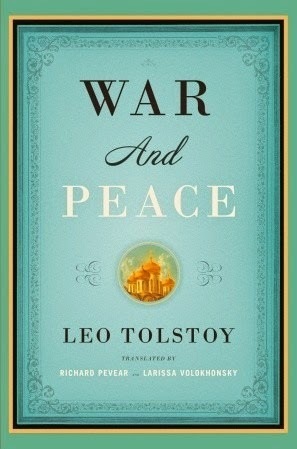 War and Peace takes place during the Napoleonic Wars of 1805-1812 and follows several aristocratic families in Petersburg and Moscow, as well as some of the family members who are in the military in various locations. It opens with the death of Count Bezhukov and some intrigue surrounding his beneficiary, who ends up being his illegitimate son, Pierre. Among the families are the beginnings of various romantic entanglements. Then the story moves on to a military setting and it all became extremely unclear to me. There were cavalries and hussars and dragoons and the burning of bridges, along with a little gambling thrown in for good measure, and one of our main characters was injured. History is not my strong subject, and military maneuvers are completely mystifying to me. The problem is that I often can't visualize what is happening, so it doesn't stick in my head from one moment to the next and the whole story becomes extremely difficult to follow. So I'm doing a lot better with the peace portions of this novel than the war. But luckily we're talking about it in class so I'll be sure to come away with the important bits one way or another. Our instructor is not only well-versed in this novel, Tolstoy's life, and Russian history, she asks thought-provoking questions that go far beyond keeping all the characters straight. It makes me very glad I signed up because, as I predicted, I'm getting much more out of it than if I had just tried to plow through this novel on my own. So far she is emphasizing the characters, their philosophies, and asking us to consider how they change during the novel. Thankfully, she is less concerned with the historical events. Still, it all makes me feel just a bit incompetent. As surprising as it may seem to anyone who knows how much I read and how much my life revolves around books, I wasn't an English major. I took a few classes on Russian literature in college, but I'm not really used to discussing books in this way. I'm unfamiliar with many of the themes and ways of looking at literature that come second-hand to those more versed in this sort of thinking. So it's a big challenge, but one that I think will be a good learning experience. In the meantime, I'm still doing a bit of other reading, so expect a couple of reviews soon.